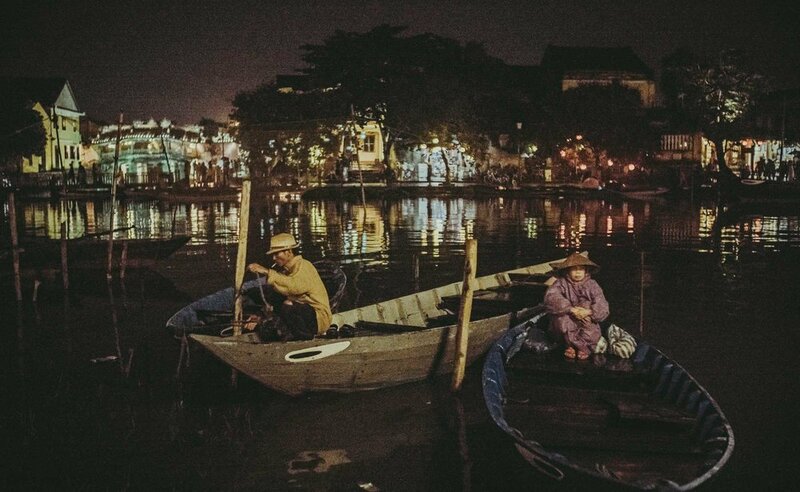 We’ve made our arrival in Hoi An; a refreshing and welcomed break from the bustle of Ho Chi Minh. After a night with hardly any sleep in our Saigon hotel – which consisted of a small TV and fridge, two single spring-loaded mattresses with which our ribs were constantly wrestling, and a boarded up window isolating us from any sense of time, weather, and daylight – we made our way out to the street for breakfast surprisingly early. Most of the main street was not yet in operation, with shops and street vendors setting up and turning us away requesting we return later. Taking full advantage of the local fare, we indulged in another delicious meal; chicken Pho (pronounced Fa) iced Vietnamese coffees which host a dark yet naturally sweetened flavour, fresh coconut juice drank straight from the source with a straw, and decadent mango and papaya salads topped with fish sauce and peanuts. The food here is yet to fail us. Sauntering further down the street, we find a Vietkong themed tea house, walls lined with old tattered books in the native language, maintained by staff donning military garb. We make our way inside past the green canvas lawn chairs and take a seat to indulge in some delicious iced teas while completing our digital documentation of the previous day. It’s finally time to leave the city. After saying goodbye to our hosts at the hotel and their adorable puppy, Lucky, we link up with the driver they arranged to take us to the airport and make our way through the morning traffic haze. The driver is an enthusiastic young man learning to speak English. All things considered, his comprehension and limited vocabulary are surprisingly good in a city where most have seemingly mastered only several key phrases. Time to see what our $30 CAD flights to Da Nang are all about. The airport check-in is the quickest experience we’ve ever witnessed. No line-ups, minimal protocol, and friendly attendants. It’s fascinating how much of a contrast the experience is to the predictable seriousness, slow-crawling process and extortionate costs we that are the standard in North America. We finally bump into other travelers who engage us and share their experiences while inquiring about our own; true adventurers seeking refuge from the potent party scene we left behind. 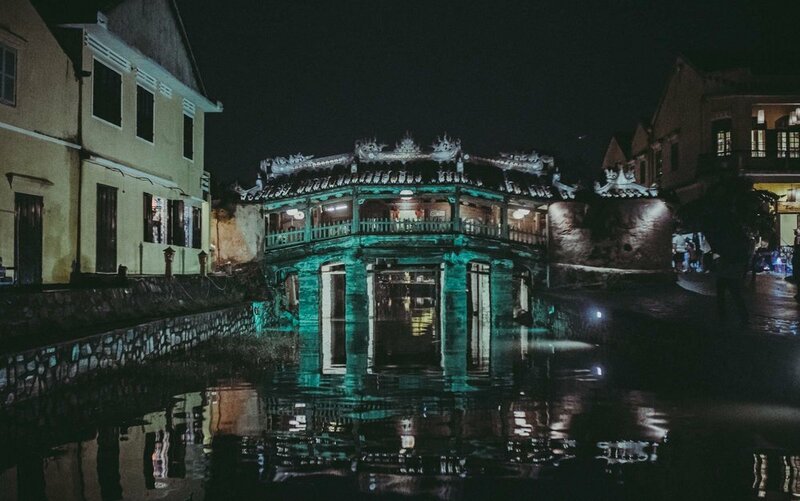 It seems like most are on the same trajectory as us – a quick flight to Da Nang from Ho Chi Minh to get within a reasonable proximity of Hoi An, a small town known for its tailors, cuisine, artisans and merchants. Our white-bred expectations are quickly thrown out the window when we’re met with a large modern passenger plane instead of a sketchy propeller plane. Leg room is ample, seating is spacious and the flight is only half full. Once on the ground we negotiate a cab fare for the 45-minute drive South from Da Nang to Hoi An and share with two other travelers - Mark and George from Birmingham and London, England. The cost works out to 450,000 Dong, or $27 CAD at the current exchange rate. Our companions are friendly and relatable, as we exchange stories of our experiences in places eachother have been, as well as information about our own countries. The Vietnamese countryside is a desolate and depressing sight. Shanty’s without windows or doorways host residents hiding from the rainfall and incoming storm, drying their clothes on lines inside, sitting on their front stoops watching the tour busses and cabs pass them by. Their way of life can only be imagined as difficult. Cattle roam the shoulders of the road to our right, lined by rice fields, while our left is occupied by coastline appearing to be either boarded up and awaiting development or donning large strips of property with no inhabitants or structures. It’s fascinating that such presumably prime locations are left empty or occupied by impoverished housing and shops. We are clearly in a no-man’s land - tourists likely wouldn't dare stop here. Sheet metal shacks line the riverside as we cross over into rainy Hoi An. This place is fascinatingly different from Ho Chi Minh. It’s far less developed and much smaller, with a rural charm and touristic appeal. 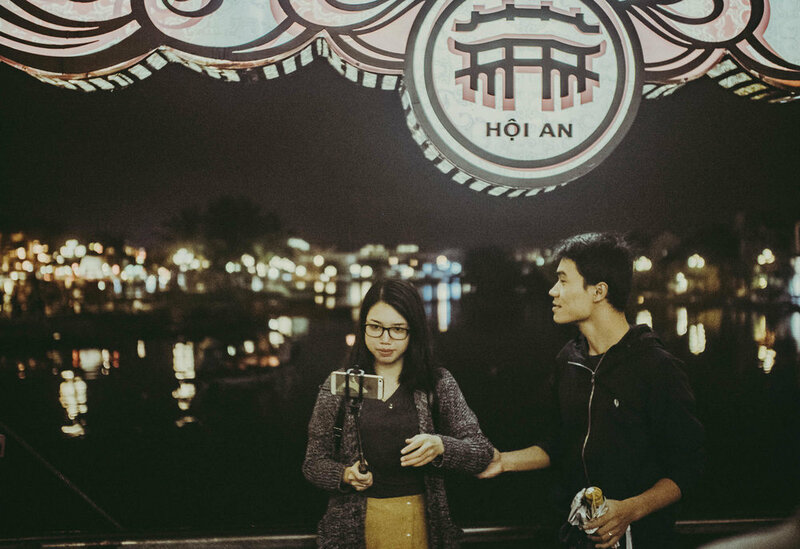 We immediately notice many shops advertising the tailored suits Hoi An is so famous for. Dropped off at their riverfront resort, we exchange contact info with our British companions as to stay in touch throughout our stay here. Arrived at our guest house, the feel is very cozy. Our host is a friendly local named Li who runs the business, also occupied by his family. They invite us in with open arms, particularly upon learning our nationality. Canadians seem to have a revered reputation here as far as we can tell. Our spacious room has a window and bright lighting; a big step up from our stay in Saigon. We relax for a while until darkness befalls the city. We enjoy a couple malt 333 beers in our room and make our way into the city to explore. We’re a stone’s throw from the heat of things and Li has an exciting outpour of information for us. 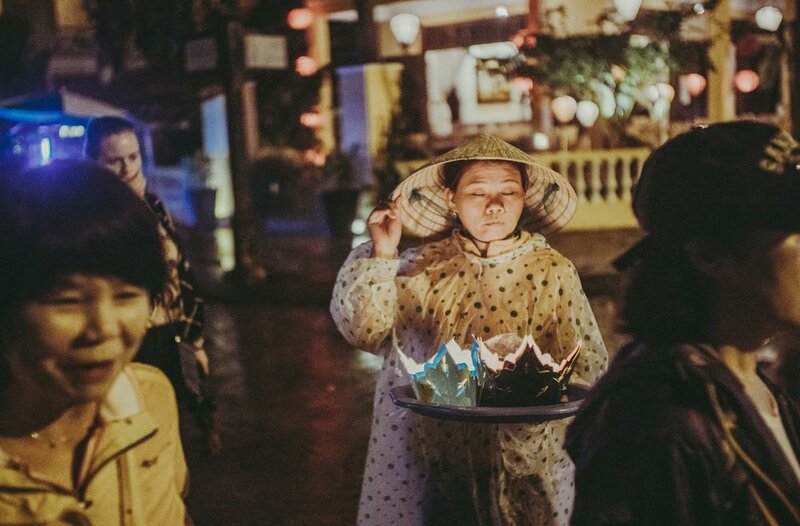 He’s spent his whole life in Hoi An, so he’s very familiar with the ins and outs. Right away it becomes obvious that we’re going to spend as much time in this charming city as possible. 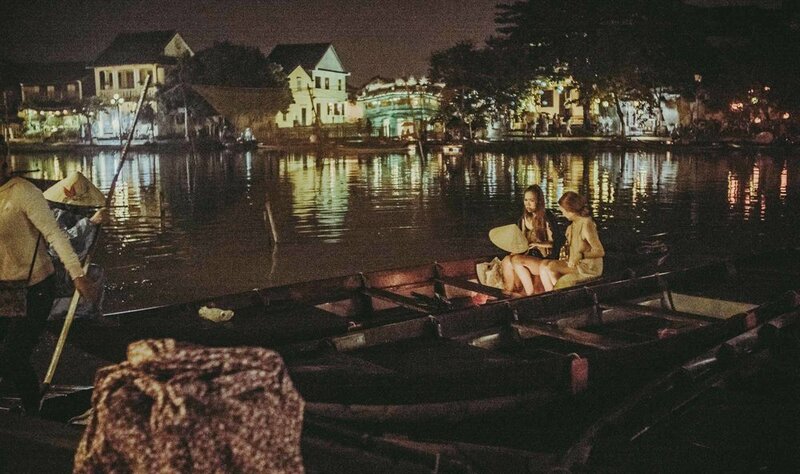 The main streets in the tourist area line the Thu Bồn river, filled with long pushboats, floating restaurants and tiny candle-lit cardboard vessels, which the locals claim are good luck. Lanterns are everywhere, filling the air with beautiful lighting and accompanying the delightful calming music heard from all angles. Local street merchants are everywhere, offering their goods in the friendliest of ways – another contrast from Saigon. We explore the beautiful streets and take notice of the signature architecture, restaurants, boutiques, and cooking schools. This place is undeniably beautiful and is already taking a firm place in our hearts. Enjoying a delicious meal on a riverfront balcony, we watch the incoming storm and feel the mist of the rain splash against our faces. Calm and peace overcome us as we share stories of our childhood and enjoy some tall Tiger beers before taking leave to our room for an early night’s sleep to fast-forward into tomorrow.